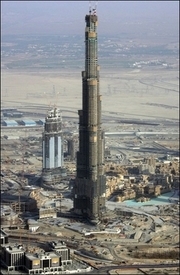 The Burj Khalifa (formerly named the Burj Dubai) is currently the world's tallest building. Located in Dubai in the United Arab Emirates, the tower reaches more than 828 meters (2,716.5 ft). Groundbreaking began on September 21, 2004 and construction was officially finished on October 21, 2009; a time span of just over five years. It officially opened to the public in a ceremony on January 4, 2010. In a surprise move, the tower was renamed the Burj Khalifa to honor Khalifa bin Zayed Al Nahyan; the president of the United Arab Emirates at its opening ceremony. The building houses apartments, hotel rooms, high end hotel suites, mechanical operations, "corporate suites", and rooms for communication and broadcast operations, however there is no conventional AM or FM radio broadcasting at the tower. Due to the infamous housing bubble burst in Dubai in 2010, declining demand caused rents in the apartments to decline by 40%. There are 900 apartments in the tower, and approximately 825 were still empty at the time. By October 2012, Emaar Properties reported that approximately 80% of the apartments were occupied and Dubai is managing a steady recovery. The total cost of constructing the building is estimated to be a grand total of the equivalent of $1.5 billion American dollars. This page was last modified on 30 October 2016, at 11:59.